Dr. Courtney is a native Mobilian and graduate of McGill-Toolen High School (1984). He graduated from Auburn University in 1988 with his B.S. in chemistry. He received his doctorate in veterinary medicine in 1991. Dr. Courtney is very much a pet lover and he owns a chocolate lab named ZuZu and the two office cats Pearl and Roxanne. Dr. Fuller is from Ozark, Alabama where she graduated from Carroll High School in 1998. She continued her studies at Auburn University with a major in Animal Science Pre-Vet in undergraduate, and completed her doctorate of veterinary medicine in 2005. Dr. Fuller begin working at Bit & Spur Animal Hospital in 2005- 2010. She re-joined the Bit & Spur team again in November 2011! When not caring for clients and their pets, she enjoys fishing, all five of her dogs & one cat, and the gulf coast water. Dr. Connor E. Sindel, D.V.M. Dr. Sindel was born and raised in Mobile and graduated from St. Paul’s Episcopal School. 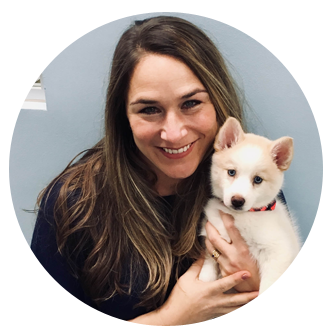 After attending college in Vermont, she returned to her Alabama roots and received her Doctorate of Veterinary Medicine from Auburn University. Dr. Sindel’s areas of special interest are dentistry, dermatology, behavior, soft tissue surgery, and exotic animal medicine. She spends most of her free time swimming, hiking, and running with her German shepherd- Carson or spoiling her tow cats- Floyd & Gilbert. Dr. Sindel is thrilled to be back in Mobile among family & friends. As our Hospital Manager, Kelley is responsible for the overall hospital organization, and day to day operations. She is also responsible for the hospital’s finances, marketing, and human resources departments. When she’s not at the hospital, you may find her playing ball with her two labs, Roman and Roxie. As Director of Pet Nursing, Clay is responsible for safety, organization, and day to day operations in the very heart of the hospital, the treatment area. He is also responsible for inventory, and the hands-on training of technicians and assistants. If you visit our hospital you are sure to be greeted by one of our customer service coordinator’s smiling faces. Everyday the customer service coordinators make sure clients and patients feel welcome and comfortable during their check in and check out. When you call our hospital one of our friendly appointment coordinators will be happy to assist you in any way. Each day the appointment coordinators make sure clients get the answers they need in addition to scheduling any appointments. The veterinary technicians have many responsibilities throughout the hospital. Some of these duties include giving medications, taking x-rays, perform laboratory procedures, assisting in exam rooms and educating clients on basic pet care. The veterinary assistants assist in exam rooms and assist veterinarians in routine procedures. The veterinary assistants and technician assistants have many duties including assisting with treatments, assisting with laboratory procedures, and assisting the whole team with pet care and patient comfort. As the kennel supervisor, Jamie is responsible for safety, organization, and day to day operations in the bathing, grooming and kennel areas of the hospital. She is also responsible for making sure the pets are kept happy and comfortable during their stay with us. The kennel attendants are a very important part of our team. They make sure the pets are kept happy and comfortable during their stay as well as assisting the veterinarians and technicians in a wide variety of tasks.